- Captain Spaulding (Groucho Marx), in "Animal Crackers"
There's joyous news for comedy fans from Universal: the first five Marx Brothers films are finally on DVD, in a swanky, stylish six-disc set. Watching these movies, you can see and hear sound film comedy being invented, and you can see three of the all-time great screen comedians solidifying their on-screen personae—Harpo, Chico, and Groucho—as cultural figures, transcend the movies that they're in. If you see a guy in blond wig with a foghorn; or one in a silly hat with a comically false Italian accent; or especially one with a greasepaint moustache and eyebrows, wire-rim glasses, a big cigar, and an endless stream of zingers, you know just what you're looking at. These five movies also star the fourth Marx, Zeppo; that's trumpeted as one of the selling points on the promo copy with this set, and while I have no reason to doubt that Zeppo was a very nice man, in terms of performance, he's nobody's favorite. The brothers travel to the Sunshine State for their feature film debut, and you can see from the opening credits that they come with a first-class pedigree: music and lyrics by Irving Berlin, book by George S. Kaufman. The boys are injected into what seems like an otherwise pretty pedestrian flapper melodrama—the locale is the Hotel De Cocoanut, of which Hammer (Groucho) is the manager. The ingénue is Polly Potter (Mary Eaton), rich girl in love with Bob Adams (Oscar Shaw), an aspiring architect making rent by working as a clerk at the hotel. But that's far too déclassé for Polly's mother, Mrs. Potter; she's a rich old widow, and at least one camp has designs on stealing her jewels. All of this is of course just the necessary scaffolding for the Marxes to run wild. Their onscreen personae are already firmly established here: Groucho the moustachioed wiseacre; Chico the scammer with the bad accent; and Harpo the silent one, who is pure appetite: food, women, anarchy. (The one thing that gets nudged a bit later on: here Harpo's curly wig is red, not his trademark blond.) Zeppo is on hand as well; the accompanying publicity materials make the point that these are the only movies with ALL the Marx brothers, Zeppo included. No offense intended to him, but frankly that's not much of a boast—he lacks a defined character, displays no sense of humor, and isn't even allowed to play the romantic lead. But the other three make it worthwhile, that's for sure. Groucho is priceless as the hotel manager who can't meet payroll; and Mrs. Potter is played by the incomparable Margaret Dumont, making this the first onscreen pairing of Groucho with his foil of choice. A swindler from the jump, Groucho hawks Florida real estate, making him a comic forebear to the guys in Glengarry Glen Ross; given Harpo's cultivated muteness, it's no surprise that Groucho and Chico here establish that the best dialogue and patter routines will always be between the two of them. (Why a duck?) Some of the gags must have been lifted straight from the stage production in which the brothers starred; one sequence, with lots of slamming doors between two adjacent hotel rooms, is little more than a proscenium theater comic setup played out before a motion picture camera. There's a kitchen sink feel to some of the filmmaking, and it's a little uneven—there are many, many reprises of When My Dreams Come True, for instance, but sadly, none of them by Groucho; and a nonsense flapper number called Monkey Doodle Doo, and a Busby Berkeley-like chorus of dancing bellhops shot from above. The question seems to be not: why all these musical numbers? But rather: why not? As this is the first Marx Brothers feature, Harpo inevitably plays the harp; it's hard to imagine the bedlam and chaos that these lunatic vaudevillians must have churned up, though it's certainly easy to see why they were so immediately beloved. There's a huge stairway landing in the Rittenhouse mansion, which looks suspiciously like a proscenium set; again, this adds to the sense that what we're seeing here is in large measure a filmed play, but the jokes transfer just fine. Chico shows up as Signor Rivelli, along with an academic known merely as the Professor, played by Harpo, whose academic bona fides aren't made clear, not that they need to be. The film repeats the story elements of the rich girl and her poor beau—here it's Arabella, Mrs. Rittenhouse's daughter, and her aspiring artist boyfriend; there is in fact even less story in this movie, but again, it's all about the jokes, and most of them remain very funny. A few are a little obscure, though; Groucho does an extended riff parodying Eugene O'Neill's Strange Interlude, and unless you're a diehard fan of pre-war dramatic theater, these will probably be lost on you. At nearly 97 minutes, this is the longest film in this boxed set, and at times it even feels padded out a little—Chico gets a whole lot of time at the piano, and the song between the young lovers doesn't add much value. Zeppo plays Jamison, Captain Spaulding's personal secretary, and the attempts between him and Groucho to fire up some comedy feel almost painfully labored. Aside from Dumont, especially noteworthy in the supporting cast is Robert Greig, as Mrs. Rittenhouse's butler; he seems to have had a career playing manservants in some of the great comedies of the Thirties and Forties, as he plays a similar role in, among others, Sullivan's Travels. Three cheers for Captain Spaulding! Monkey Business makes no bones about what it's about, and that's providing a platform for the Marxes to (ahem) monkey around. Story has pretty much been dispensed with—the brothers stow away on an ocean liner, and spend the better part of the picture on the lam. The movie doesn't even give them character names—perhaps at this point they were such well-known personae that names aren't necessary, because whatever they're in, we know them principally as Groucho, Chico, and Harpo. S. J. Perelman shares a screenwriting credit on this one, and if it's not a masterpiece of story construction, a lot of it is pretty funny. What plot there is concerns a couple of gangsters on board the ship—Groucho and Zeppo are pressed into service as the muscle for one of them, while Harpo and Chico are doing the same for the other. Unsurprisingly, Groucho is trying to make time with the wife of one of the bad guys—it's never a good idea to mess around with another man's woman, especially when that man is packing heat. Sadly missing from this film is Margaret Dumont—Groucho's leering just isn't the same without her. And though much of this is funny, the slapstick is more violent and wounding than in the other Marx pictures; it's closer to the physical cruelty we associate with the Three Stooges. What O'Neill was to Animal Crackers, Maurice Chevalier is to Duck Soup—i.e., the pop culture reference that was widely known in the early 1930s, but seems pretty obscure today. The movie is also particularly noteworthy for its production design; the art deco sets for the ship are especially pleasing and impressive. Lock the door to the sorority house, ladies, because the Marx Brothers are coming to campus. Academia is among the institutions most worthy of being razzed by the boys; there's almost as much pretension during a day at the ivory tower than there is on A Night at the Opera. In this one, Perelman and his screenwriting colleagues seem to have gotten the patter down perfectly—there may be more jokes per minute in this movie than in any other ever made. And the story, even if it isn't ever the standout in Marx Brothers movies, retains some relevance even today, even if your name isn't Maurice Clarett or Jim Tressel. That is, are the lofty academics going to get into the dirty business of buying football players, so that they can beat their bitter crosstown rivals? Even the use of music shows a little more flair in this one, in part because they've got a winning song, Everyone Says I Love You, to use in all kinds of ways, and to provide fodder for Woody Allen to boot. The extended final sequence on the football field is rich with physical comedy, and Groucho's antics with the coeds in the stands put Nicolette Sheridan and Terrell Owens to shame. 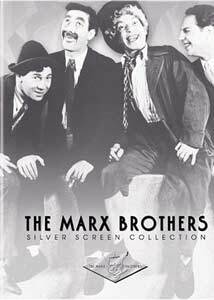 The capstone of this boxed set may be the Marx Brothers finest hour; and, clocking in at just over sixty-eight minutes, it's probably the most efficient political satire ever made. It belongs on the short list, with Dr. Strangelove, of all-time great political comedies, and it goes down a whole lot easier than anything you'll ever have to read in a poli sci class. Welcome to Freedonia, a nation-state of fuzzy origin and location; what matters is not where it is, but who's in charge. And that would be Rufus T. Firefly (Groucho), the bull in the Freedonian china shop—all the pomp and circumstance of state are presented with all the trimmings, so that Groucho can puncture them. Freedonia's archrival is the duchy of Sylvania, and those damn Sylvanians have employed a couple of spies, Chicolini and Pinky (Chico and Harpo); and the only thing between Freedonia and bankruptcy is the personal wealth of Mrs. Teasdale (Margaret Dumont again), and Firefly wants to get every last bit of it, and not for the Freedonian treasury, either. The movie is just brimming with vaudevillian gags, many of them stuffed in there not because they move the story along, but because they're funny; and you can see the technical craft in the moviemaking pushing forward as well. It's a movie with various locations and special effects, the stuff that you couldn't do on stage; then again, the streets of Freedonia, where Chico and Harpo harass the merchants, look a whole lot like the Paramount backlot. Part of the filmic quality may be due to the fact that the director here is Leo McCarey, one of the best in Hollywood at the time—just a couple of years later, he would win an Oscar for his work on The Awful Truth. Still, you can feel film grammar being worked out, as the editing frequently cuts in on axis, the kind of thing that seems oddly jarring to us now. Similarly, the film tosses off the occasional ethnic joke, which might have gone over with Thirties audiences, but viewed now are likely to throw you out of the whimsy of the rest of the picture. It's worth coming back to, though, not just for the physical comedy—though the mirror gag with Chico and Groucho is priceless—but because of the stuff that remains pungent about the absurdities of excessive patriotism. As many other governments have done before and after, the Firefly Administration discovers the best way to divert attention from corruption and incompetence: war! Groucho in the bunker in his Johnny Reb cap is gloriously silly, as is the huge production number that proceeds the battle—it's this very sequence that made Mia Farrow so happy in the last moments of The Purple Rose of Cairo. Feel free to draw parallels to the current political climate; your conclusions are your own. Image Transfer Review: These films have been ravaged by time, and that's very much on display in the transfer to DVD. Animal Crackers undoubtedly looks the worst; there are missing frames, mismatched frames in the same scene, lots of scratches, and evidence of a huge amount of bacterial decay and acid burn. The others look marginally better—the Duck Soup transfer is certainly an improvement on the one that Image used for its previous release of the title—but this is a set that you'll want to watch despite the quality of the image, not because of it. Audio Transfer Review: The Cocoanuts has only an English mono track; the other four films have Spanish tracks, too, and you can almost hear the evolution of sound pictures over the course of this set. The Cocoanuts, made just two years after The Jazz Singer, is the most ragged; the soundtrack is full of static, bad dynamics, and an out-of-balance musical score, all of which is not atypical of early talkies. Duck Soup occasionally sounds a little muffled, too, but you take what you can get. Extras Review: For a set this grand, this one is mighty light on the extras. A bonus sixth disc holds only three clips from the Today show, little more than Marx Brothers ephemera. The first is a 1961 interview (07m:15s) with Harpo, on hand to promote his autobiography; he clowns with the hosts, has brought lots of props, and of course remains mute throughout. The next is a 1963 visit (04m:52s) with Groucho, featuring a seminar on his patented duck walk; and the last (04m:39s) is a 1985 appearance by William Marx, Harpo's son; he and Gene Shalit chat about his family, and he shows some brief clips of old home movies. In this respect, this set obviously suffers in comparison with the Warner release of the later titles, which are brimming with documentaries, commentaries and all sorts of other goodies. Original trailers accompany Animal Crackers, Horse Feathers, and Duck Soup. The discs are housed in a handsome foldout case that's festooned with many photographs of the Marxes, and has an attached 40-page booklet with brief notes on the films, poster reproductions, and chapter listings for the DVDs. If these movies don't make you laugh, check your pulse, because all these decades later, this quintet of pictures from the earliest days of sound remain among the best and funniest screen comedies of all time. I'm partial to Duck Soup, myself, but there are plenty of laughs in each of them; the extras don't nearly measure up to those you'll find on the Warner releases of the Marxes' later films, and the technical values might not be everything you'd hope for, but these discs are still a blessing, and how that elephant got in my pajamas, I don't know.